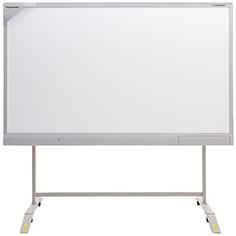 Panasonic's UB-T780 Interactive Whiteboard will help energize your meetings, keep your students engaged and focus the attention on the topic. Complete with an abundance of interactive technologies, the UB-T780 is the tool you need to keep those ideas flowing and engage your audience. Save projected notes directly on your PC. With remote PC operation, anything you write with the electronic pen can be saved with your application. Take the elite Panaboard Book software and engage your students with interactive learning. Bring your own curriculum to the table inside our software and immerse your students in the topic using tools geared to make learning fun. Teleconferencing - When used in conjunction with web-conferencing software, provides a cost-effective real-time teleconferencing solution so everyone can attend the meeting, on-site or remotely.